Mountain organic eggs from hens grown according to the principles of the 5 H Club. Respecting the animal, the environment and the health of the consumer. “Il Fiore delle Dolomiti” is a fully evolving reality. This family business was built from scratch in 2015 in Limana (Belluno). The farm layout consists of 5 sheds (which look like the petals of a flower from above), each of which accommodates 3000 laying hens, with the offices and packaging plant located in the centre. The SKA company, which specializes in the production of equipment for layers housed on the floor and in alternative systems, have been closely involved in the project through the design and building phases as well as supplying all the interior equipment. 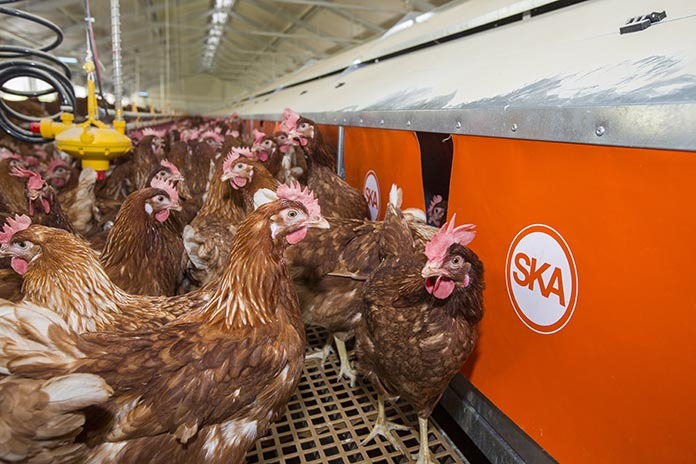 The owners explained that they chose the SKA company for their decades of experience in the development of alternative systems; their expertise in the organic field and their vast product range designed to provide a natural and comfortable environment for livestock. In addition, the proximity of the SKA headquarters to “Il Fiore delle Dolomiti” reduced the incidence of transport and, consequently, the potential pollution from CO2 emissions. Respect for the environment is, in fact, one of the cornerstones of the company’s business philosophy. Production began in January 2016 and every day around 14,000 eggs are packaged and then distributed directly by the company to specialized stores, delicatessens and some supermarket chains under the brand name LUOVO, which summarizes their business philosophy of managing their flocks of laying hens with respect for the animal, the environment and the health of the consumer. Hens are reared according to the principles of the 5 H Club which is an exclusive organic farming method. The 5 H Club sums up a series of values five in total, which represent and translate into good everyday practices guaranteeing the laying hens a state of complete health, in which the bird is in harmony with its environment. “The 5 H Club is a trademark, a private warranty certifi cate, which we have created and registered at European level, with reference back to the USA youth organization 4 H (Head, Heart, Hands and Health),” explained the owners. Hens reared on the Limana farm are fed GM-free rations. In addition to feeding outdoors in the open air birds are fed a mix of grit, essential to the functioning of the digestive system, combined with organic maize and soya. 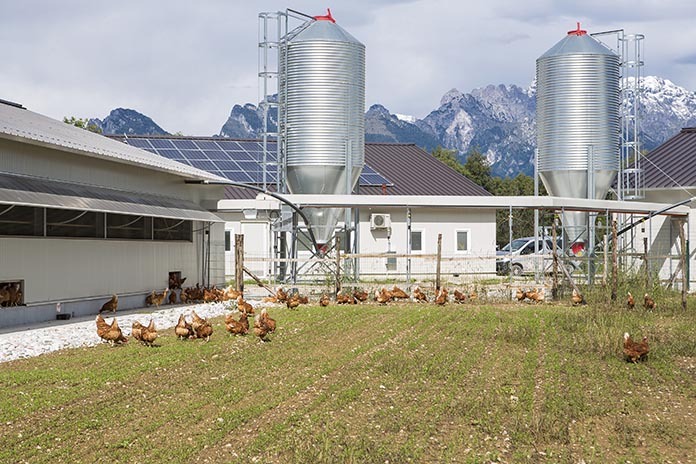 “In addition, we enrich the feed with a special variety of dark mountain corn, known as ‘Bellunese Tambar Gold’, which is nourishing and rich in fi bre and which is cultivated biologically in the Belluno area. Although its yield per hectare is very low, we choose this because the corn cobs are small and tasty and add an impressive colour to the yolk of our eggs”, say the owners. Extreme attention is also paid to the drinking system with the water being dynamized thanks to the innovative AquaPhi™ natural system where the latest technology manages to retain all the original properties of the water. Eggs are selected and packed by hand in wooden pulp boxes on the farm thereby eliminating the need to transport them to external packing centres. This guarantees the freshness of the product, greater protection of the environment and the total absence of the risk that organic eggs will come into contact with eggs of other types. 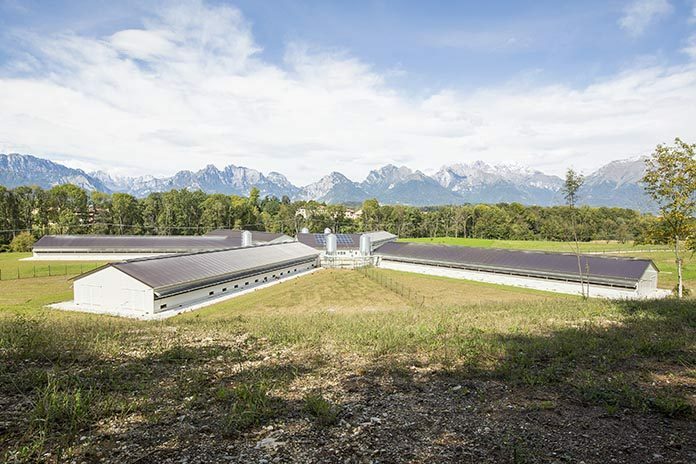 The whole company operates in an environmentally friendly manner with the installation of photo-voltaic systems installed on the roof for self-production of energy which is supplied through NWG Energia, the only company in Italy that, by statute, provides energy exclusively from renewables. In addition, only LED lights are used in all the farm buildings. With its traditional vocation to customize plants, SKA has successfully managed at “Il Fiore delle Dolomiti” to build an innovative and highly technological set up. All the structures are galvanized steel, and are equipped with poly-carbonate windows. 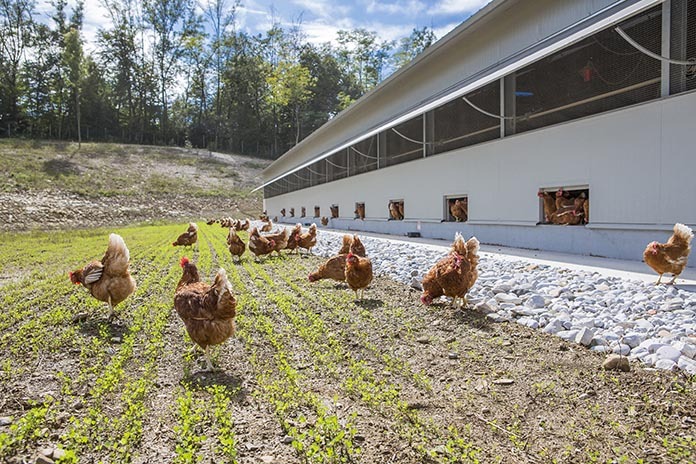 The “AVIO 500” communal automatic nests, arranged in a single longitudinal central row in the shed, providing the hens with a very comfortable environment for laying eggs. Particular attention has been paid in designing the nests to ensure eggs are not damaged and are kept clean. 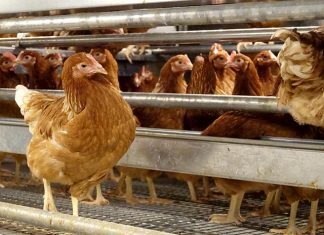 Hens have the choice of two entry points to the nest set-up and lay their eggs on a special mat made of synthetic material “AstroTurf” and the eggs roll gently into a central collecting channel, set between the two rows of nest boxes. 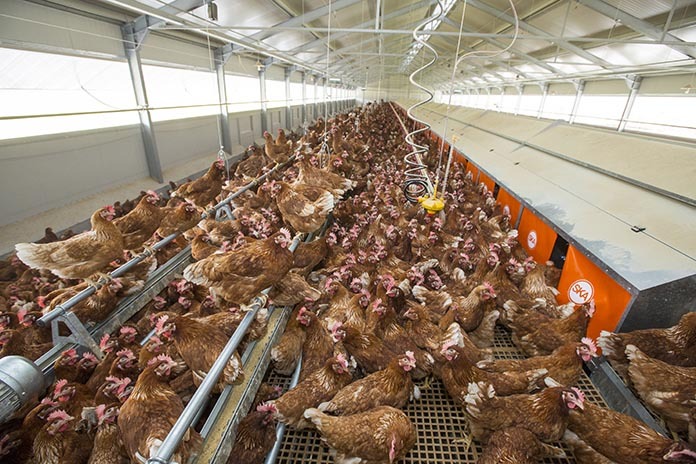 Eggs are conveyed on a wide rigid polypropylene belt with a variable speed traction unit to the designated egg collection table. The SKA cross conveyor “SPIRALINE 90.” system has been installed as the automatic system for transporting feed from the silo to the in-house feeding layout. For the “Il Fiore delle Dolomiti” company SKA decided to install the “FLATLINE” chain feeder system renowned for its proven reliability for fast, uniform transportation of feed. Thanks to this system, all hens are able to feed evenly and at the same time.